Paying with a smartphone would win over 31% of all those asked if they then only needed to have their smartphone with them and could do without a purse or wallet, a new survey conducted for retailer-owned mobile payments provider Yapital by TNS Infratest has found. Some 33% of the 1,004 German consumers surveyed would like to make mobile payments at gas stations, 33% would like to pay for their bus and train tickets using their phone and 30% of respondents would like to use mobile payment solutions in supermarkets and drug stores. 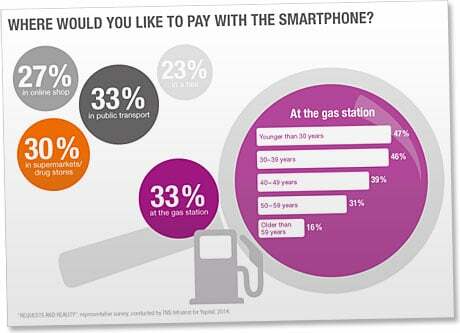 Additional information, such as always having an up-to-date insight into spending, provided added value to paying by smartphone that 29% would find “convincing”, and 29% of respondents would “appreciate” making mobile payments everywhere — in stores, online and when paying a paper bill or invoice. The survey also found 28% of respondents would appreciate a faster payment process with 83% of under 30s agreeing that they are “irritated by standing at the checkout in a shop” and, overall, 20% saying that paying at an online checkout takes “too long”. Meanwhile, 43% of those aged between 30 and 39 and 30% of over 60s are also annoyed about the need to enter transaction-related data when paying an invoice.